To prepare your family and home for the possibility of an evacuation for any reason, provision your boat with non-perishable canned and dry foods, bottled water, plus food, any medicines and leash and harness for each pet. Don't forget your cellphone and charger and a flashlight. The recent Alberta fires brought back too-vivid memories of firestorms, particularly those of 2003 and 2007, that blanketed San Diego boats with ash. Many fellow marina residents found refuge with their families on their boats and were grateful for a familiar and welcoming sanctuary. Thanks to disappointing El Niño rains that produced abundant fire fuel without quenching our region’s thirst, fire officials have issued early warnings of a potentially nasty and ever-lengthening fire season. Coupled with alerts from seismologists about the growing likelihood of a San Andreas or other fault rupture, plus periodic disasters throughout the state, we all need to prepare to evacuate our homes at short notice. Those of us fortunate enough to own a boat with living quarters can readily transfer our lives to our boats — assuming roads and bridges are open. Proper planning and adequate provisioning can see us through an emergency evacuation. If we’ve equipped our boats with duplicate copies of essential documentation, even if we lose our home, we’ll have a step up rebuilding our lives while becoming liveaboards. Former slip mates lived aboard their boat for over a year after losing their home in a fire. How can we best prepare for a sudden evacuation and transfer to our boat? While the Federal Emergency Management Administration (FEMA) and the Red Cross have useful evacuation instructions and lists on their websites at ready.gov and redcross.org, the best checklists I’ve found are at TheSurvivalMom.com. The Survival Mom author Lisa Bedford provides thorough lists of financial, insurance, personal, medical and pet-related documents she recommends assembling into a “Grab-n-Go Binder” as a key item to take with you should you have to evacuate. She advises putting all documents into protective plastic sleeves with tab dividers and stowing them into a distinctive binder that won’t be confused with anything else. Don’t forget to add photos of family members, including pets, as well pictures of your home, each room and valuables. While you’re assembling your evacuation binder make another to keep on the boat. Be sure to keep both updated. Alternatively, scan all essential documents and store them on thumb drives, one to grab and one to tuck away on the boat. I’d advise against uploading your data to the cloud because, in a major disaster or loss of electrical power, you may not be able to access the cloud. 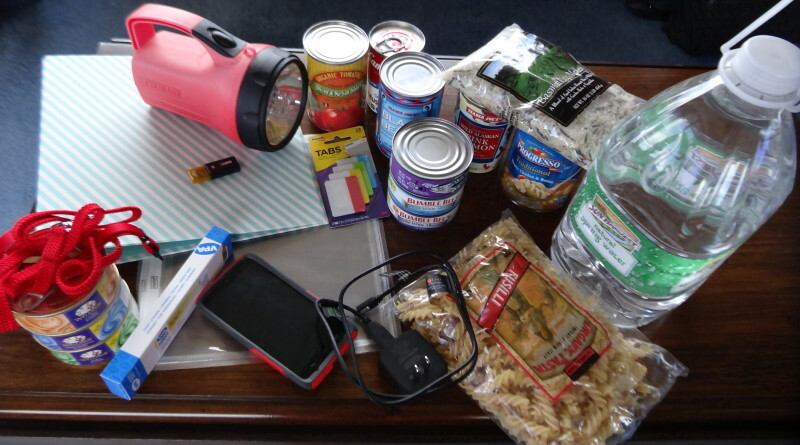 In your disaster kit, in addition to clothing, include cell phone chargers and a digital camera. Don’t forget pets! Include harnesses and leashes, food, medicines, bowls, litter box, favorite beds and toys. While preparing your boat, keep your water tanks topped up and fuel tanks reasonably full. You can use your generator for electricity if shore power is down. Keep on board provisions for at least three days, the minimum disaster specialists recommend – and refresh when “use by” dates expire. For drinking water lay in at least one gallon bottled water per person per day, plus extra for pets. When purchasing emergency rations for your boat, think cans and dry goods, not frozen, since freezers are unreliable in a power outage. Be sure to buy items your family and pets like to eat, since comfort foods make a huge difference in a crisis. Go for easy-to-prepare nourishing foods such as canned soups, tuna, poultry, beans, plus dry pasta and rice and long-life milk. On board, be sure to keep a gallon of bleach and an eyedropper to purify water (16 drops per gallon), first aid kit, portable radio (consider solar-powered or hand-crank) and extra batteries. With planning, boaters can make their boats comfortable and efficient second homes during a crisis.